Americans throw away more than 10 million tons of clothes, or about 80 pounds per person, every year. And the EPA estimates that about 84 percent of those clothes go into landfills, where they take decades to biodegrade. Many of these clothes and shoes are produced in developing countries with unfair wages, unsafe working conditions, and child labor. Celebrities like Emma Watson and Gwyneth Paltrow are calling attention to the production of clothes, shoes, and accessories and championing sustainable fashion by wearing and promoting fair-trade, recycled, and organic pieces. This year, I started trying to buy only sustainably/ethically produced or recycled clothing. Some items, likes socks, underwear, and basic tees, are easy to find and relatively inexpensive in ethical and organic versions. Other items, like purses, shoes, and jeans, are readily available secondhand at stores like Plato’s Closet and websites like thredUP.com and eBay. But then I started considering dance shoes, and was a little stumped. eBay has thousands of pairs of dance shoes for sale, but a lot of them are brand new. Some of the new shoes sell for as low as $3.18, so I can guess they are probably not being produced with ethical standards. I’m not against buying secondhand shoes, although I know that many consider it unhygienic. It’s a little easier to gauge the cleanliness and wear of a pair of used shoes that you see in person though. I have a pair of oxfords I bought at Plato’s Closet that looked like they had probably been worn once that I wear as dance shoes. The sole is smooth and easy to turn in, they’re comfortable, and I just shook a little bit of baking soda around in them before wearing them. There aren’t too many options for transparently ethical and eco-friendly dance shoes, but here’s what I found. Consider one of these brands next time you need a new pair. UK-based Ethical Wares touts itself as a seller of “cruelty free footwear and lifestyle accessories.” They currently carry 12 different styles of men and women’s dance shoes, all vegan. The shoes are made using a leather substitute called Lorica, synthetic “suede,” patent and/or satin, depending on the style. 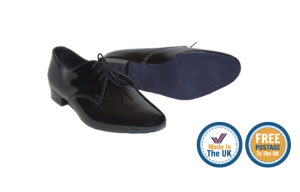 According to Ethical Wares website, most of their dance shoes are manufactured in the UK and they work closely with suppliers and manufactures to ensure “worker friendly credentials.” The shoes start around £75, or approximately $100 USD/€85, and ship internationally. Ladies shoes also available in “flesh” color. Brazil-based company Taygra only sells dance and fitness sneakers, but the sneaks aim to be as eco-friendly as possible. 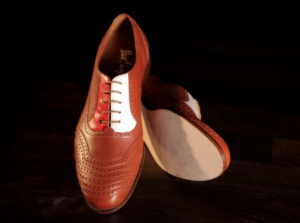 According to Taygra’s website, the shoes are made of 100 percent recyclable material. All of the scraps from production are recycled, the shoes use a non-toxic water-based glue to minimize environmental impact, and the company does not outsource any of the manufacturing. The sneakers are machine washable and have a smooth sole, you can turn in them. They carry mens and women’s styles, starting at $71.95 for on sale styles, and ship internationally. Taygra’s come in bright bold colors as well as more muted options. Named for the iconic Savoy Ballroom in Harlem, Vienna-based Saint Savoy makes men and women’s shoes inspired by the 20s, 30s, 40s, and 50s. 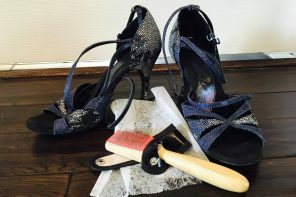 Saint Savoy’s website and Facebook page say they source the leather for the shoes according to German PCP regulations and European environmental standards. Although they don’t give too many details about production, their website says they ensure fair working conditions and their social media features pictures of shoes being produced by hand in Europe. The shoes are higher end, with prices ranging from €165-220, (approx $200-$265 USD), and ship internationally. There are styles on sale for less on their website and they run specials or sell discounted shoes with slight defects on social media . 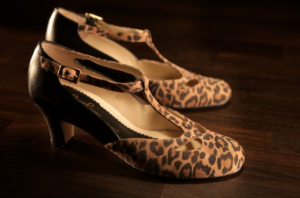 Retro-vintage styles for Lindy Hop, Swing, Balboa, and more. Very Fine Dance Shoes carries some of their products in vegan (leather free) options, but I couldn’t find much information on their production standards. Capezio has two factories in the US and their web site says “We maintain an ethical, healthy and profitable environment in which each of our employees endeavors to provide excellence in our products and services, while promoting company growth,” but what that means exactly is unclear. There are other companies, like Dance Paws and Cynthia King , that produce cruelty-free dance shoes, but these are less relevant for social dancers (Dance Paws are for barefoot dancing and Cynthia King makes vegan ballet slippers). Dance Socks are made in the USA and are nylon slip-ons that can transform tennis shoes into dance shoes and come in a version that slips over the whole shoe or just the ball of the foot. 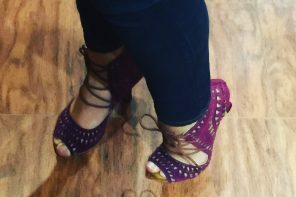 Do you own ethically/sustainably produced dance shoes or dance wear? Is the production of dance wear a factor when buying? What are your thoughts/experiences? Share in the comments!